The account admin role is separate from the admin role and grants more access to the Bridge account or sub account. As an account admin, you can manage all content, users, and settings in your account or sub account. Note: Account admins that have been added to a particular sub account do not have access to the top-level account or other sub accounts within their Bridge instance. In the Global Navigation menu, the Application Switcher icon  provides access to all main feature areas in Bridge. When an application option is selected, the Global Navigation menu displays links to the corresponding feature areas. The My Learning menu option allows you to access your My Learning page which contains courses, programs, checkpoints, and live trainings you are enrolled in . The Author menu option provides access to manage learning items in your account . The Insights menu option lets you view account statistics and user reports . The Admin menu option lets you manage users and account settings including content branding and permissions . The Insights page provides an overview of users and trainings within your domain. The statistics on the Insights page can be filtered by different time frames. Click the Time Frame drop-down menu  to change the time frame to the last 7 days, last 30 days, last 90 days, all time, or a custom date range. The chosen time frame will be applied to all statistics on the Insights page. 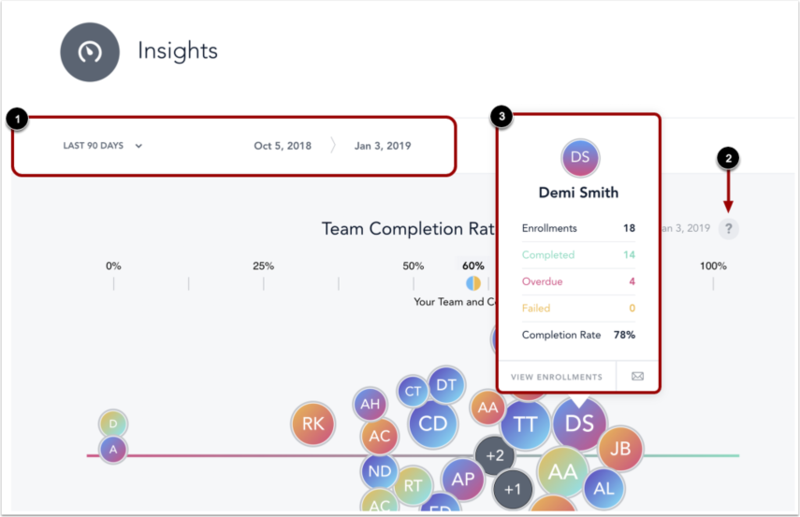 The enrollment completion visualization is the first item on the Insights page. This chart represents how your learners are performing. Click on the Explanation icon  to learn about the different elements of the chart. The chart will not be displayed to account admins if there are more than 250 learners in the account. Hover over a learner avatar to view a pop-up menu that includes the number of completed, overdue, and permanently failed enrollments and the overall completion rate . This pop-up menu also includes a link to the Learner Details page to view their specific course enrollments and a link to message the learner. You can view additional details such as statistics, reports, and graphs on the Insights page. Note: The option to message a learner will not be available if notifications have been disabled for the account. Located in the Admin menu, the Account Management menu lets you manage account settings, custom branding, sub accounts, the content marketplace, content tags, and content categories. Learn more about how to manage settings in your account. Located in the Admin menu, the Users and Permissions menu  lets you manage users, groups, permissions, and roles. You also have access to the Masquerade feature. Learn more about how to manage users and groups , manage roles and permissions, and masquerade as a user in Bridge. Located in the Admin menu, the Tools menu  lets you access the Data Export feature  and the CSV Import Log . Learn more about exporting data from your account. Previous Topic:How do I use Bridge as an admin? Next Topic:How do I use Bridge as an IT admin? Table of Contents > Getting Started > How do I use Bridge as an account admin?